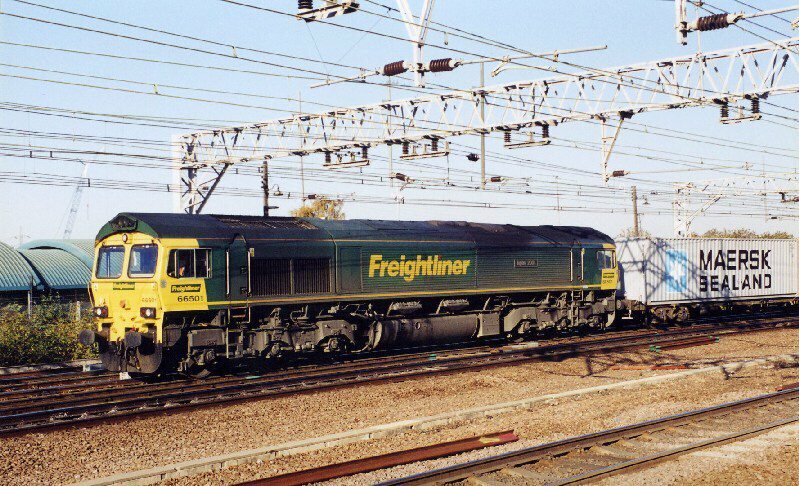 The GM that started it all off for Freightliner 66501 'Japan 2001' brings its train...the Ipswich to Tilbury liner...through Stratford on the 7th November 2003. You get a second chance to see this train as it goes into the yard at Temple Mills where the loco swaps ends and then re-appears in about 1 hour. 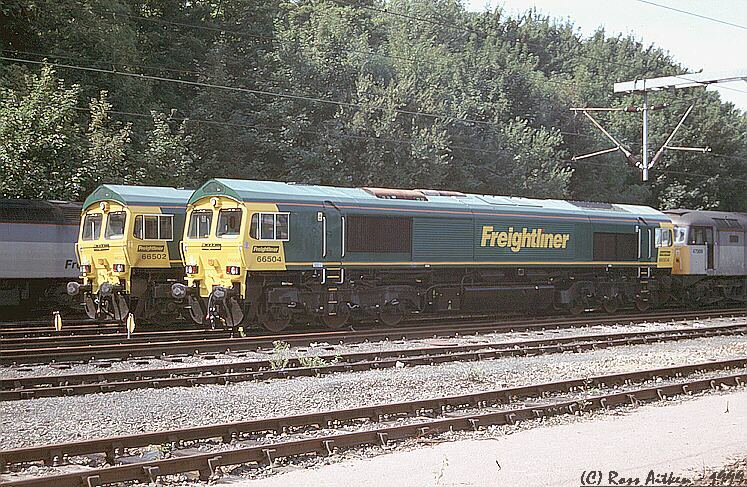 66504 & 66502 stand side by side at Ipswich stabling point on Sunday 29th August 1999. 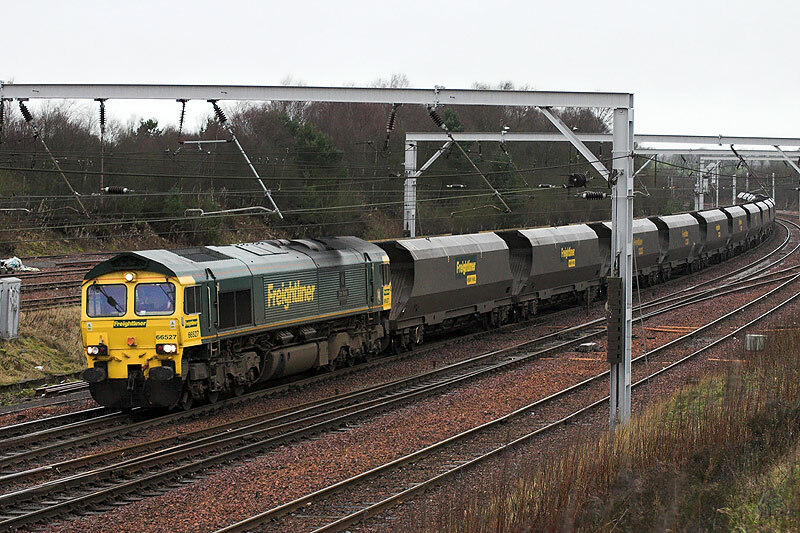 With the exeption of 66503, the other four locomotives of this first batch of five (66501-505) could all be found stabled here but 66501 & 66505 could not be photographed. 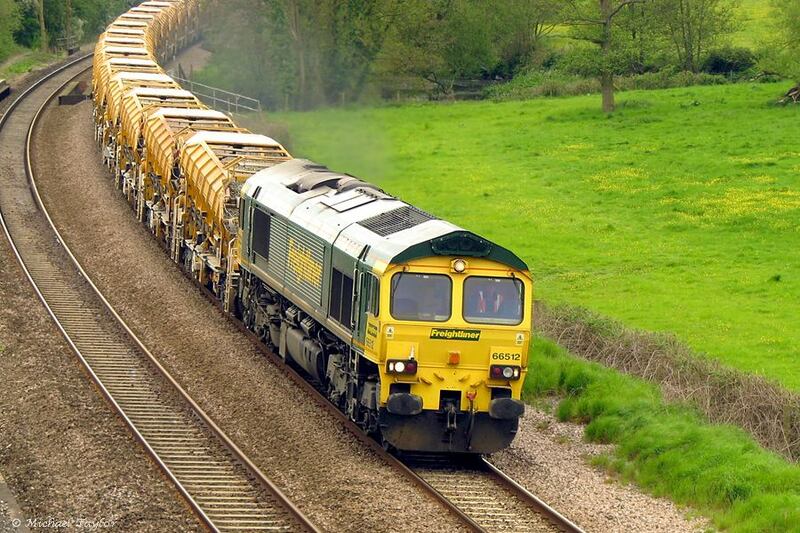 Freightliner 66512 heads north with a unit train at Cullompton, Devon on Friday, May 9th, 2008. 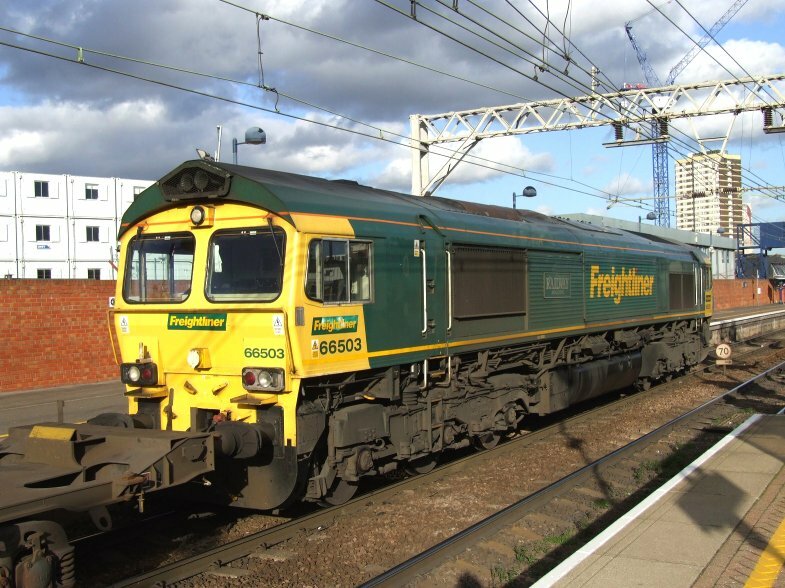 Freightliner Class 66 Diesel locomotive 66517 heads northbound through Crewe railway station. Photo by Chris McKenna 03/07/2006. 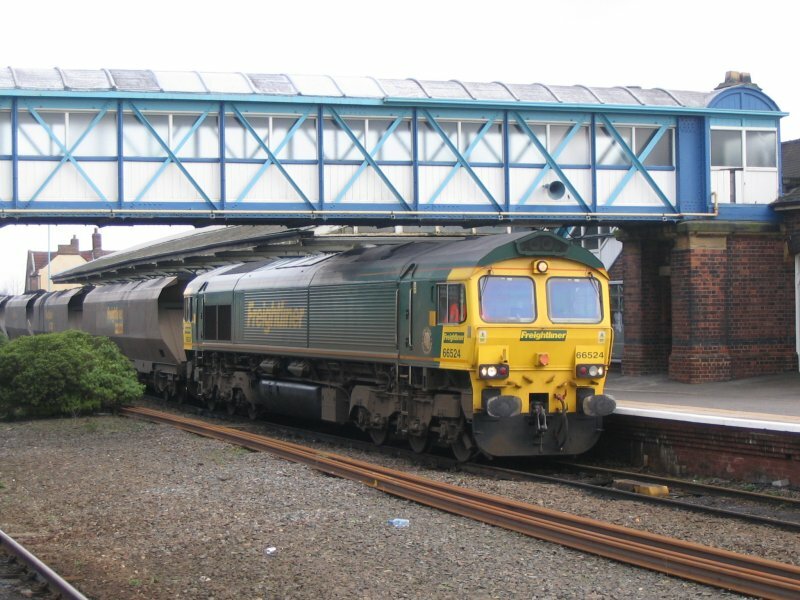 66520 passing train passing through Chester on Tuesday 26/07/05. 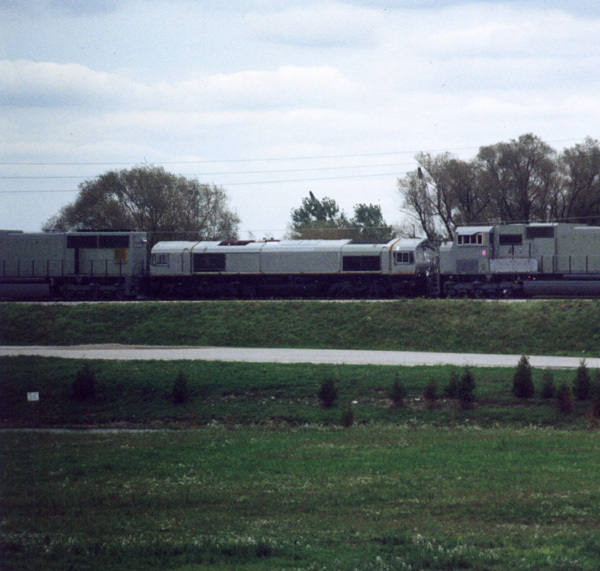 66520 as pushed outside the General motors factory in London, Ontario (Canada). Over the next 6 weeks the engine would be shunted around the plant being completed (note it is currently minus buffers, side grills, brake gear, paint etc). 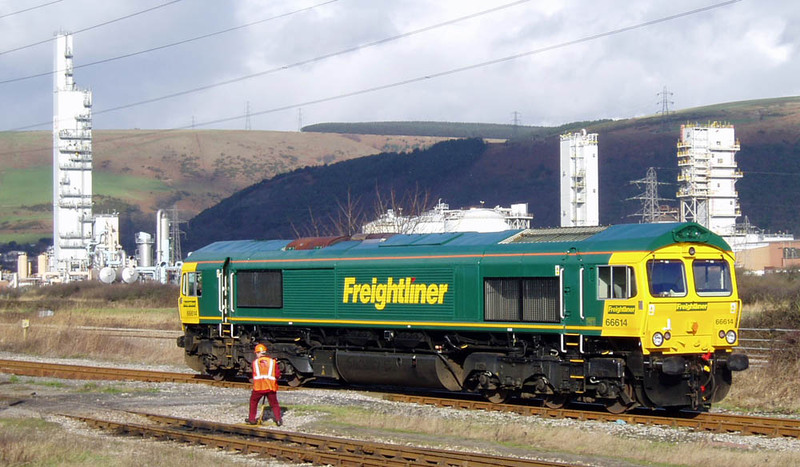 This engine would be painted in United Kingdom railways "Freightliner" Green / Yellow and Delivered in November 2000 to the UK. 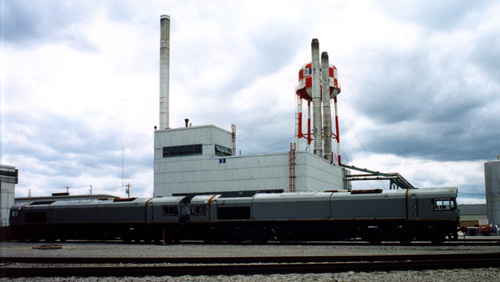 66522 as wedged at the rear of the General motors factory in London, Ontario (Canada). Over the next 6 weeks the engine would be shunted around the plant being completed (note it is currently minus buffers, side grills, brake gear, paint etc). The engine is waiting in the "despatch" line to the mainline, where it awaits space in the Paint Shop of General Motors. It will eventually leave the plant with other class members along this line. It is currently wedged between two new SD 70 Macs also in production at GM Canada for Burlington Northern Santa Fe. 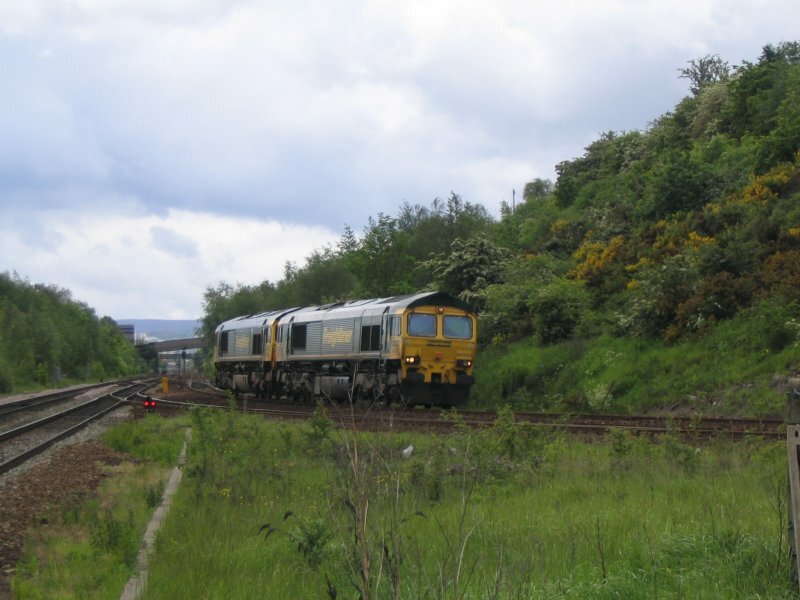 66523 on a visit to Rawtenstall on the East Lancs Railway. Freightliner Class 66/5, 66527 'Don Raider' passes through Carstairs with the loaded 6E65 14:50 Ravenstruther - Cottam 'Coal' working on Fri 19th Jan 2007 at 14:56. 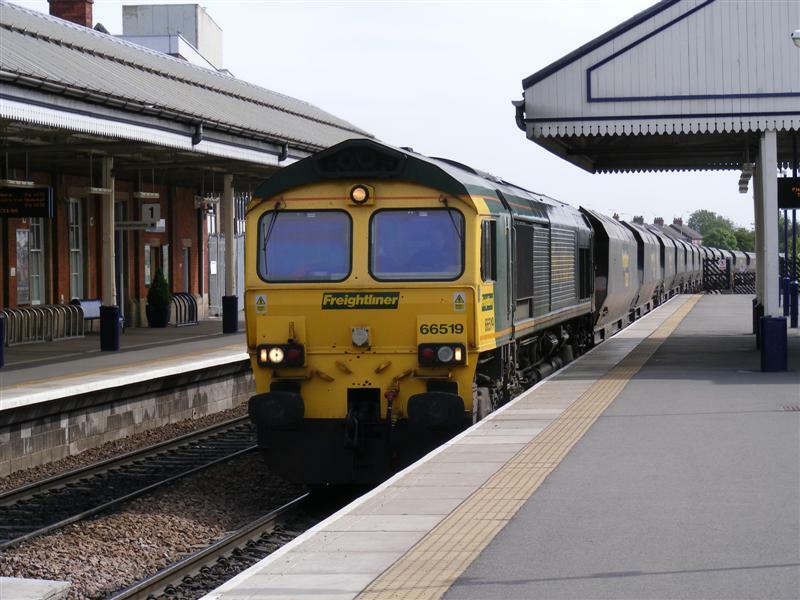 Freightliner 66614 has just come off The Valley Vostock - a Pathfinder railtour from Crewe to South Wales. 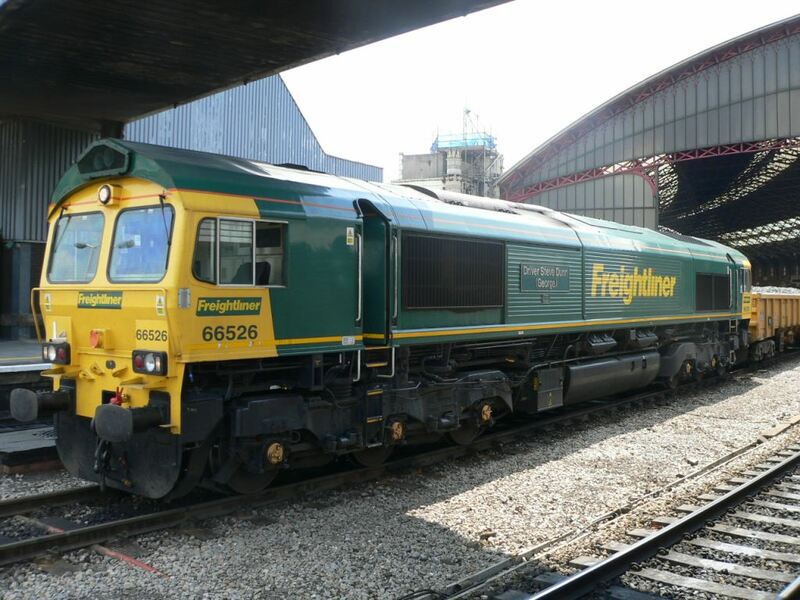 Freightliner Class 66 diesel locomotive 66523 at the very northern end of Bristol Temple Meads station. The locomotive arrived from the north, proceded no further along the platform than in this picture and then returned back north again, pausing at the station long enough only for the driver to change ends and await a green signal. What the purpose of this move was is a mystery to me! 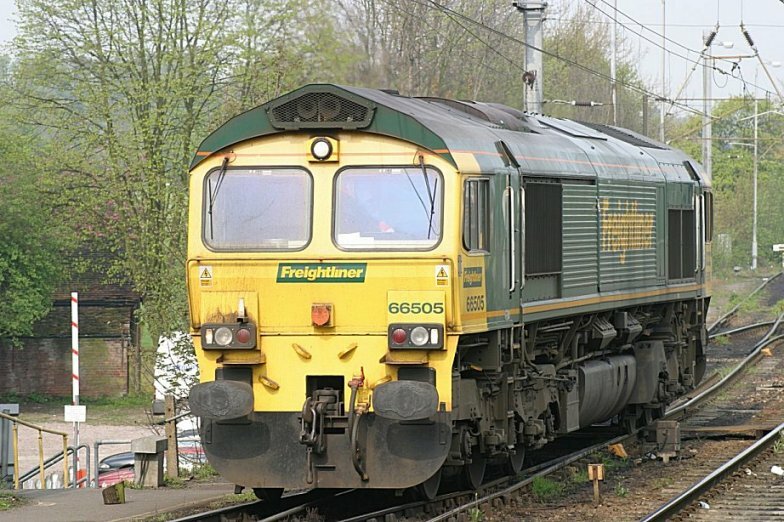 CLass 66 505 seen at Ipswich late April 2004. 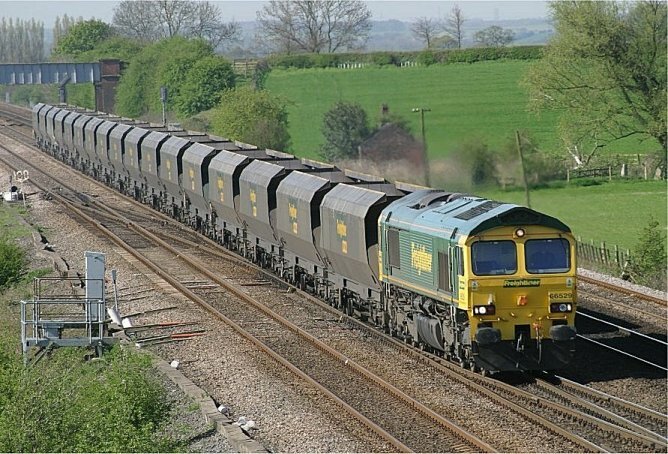 CLass 66 seen approachig Colton Junction late April 2004. 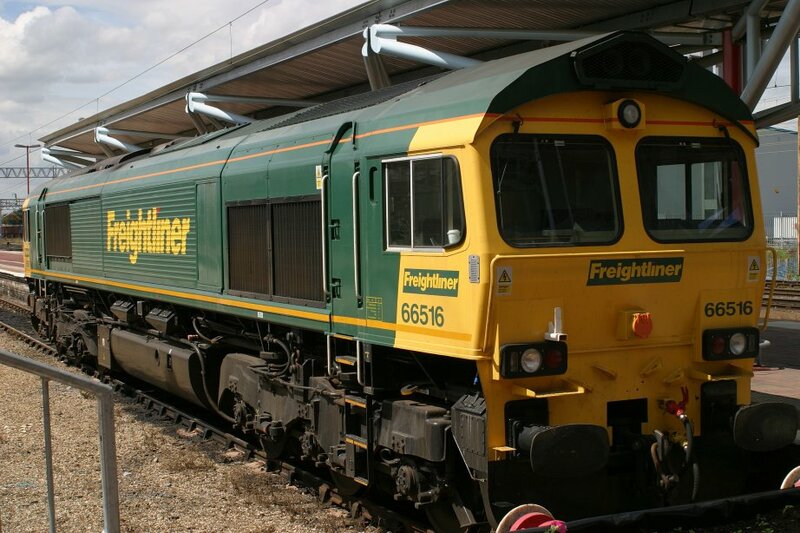 Class 66 in Freightliner livery 21 July 2003 at Rugby. 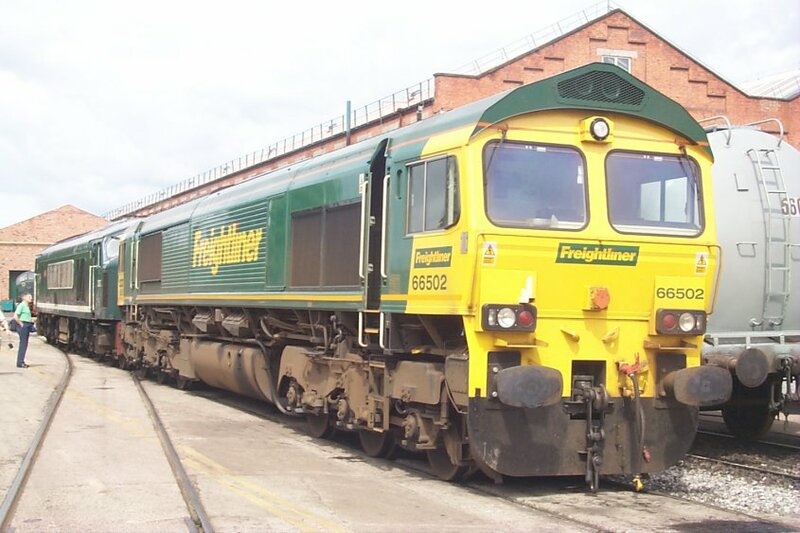 Freightliner class 66 seen posed at Crewe Works Open Day 20 May 2000. 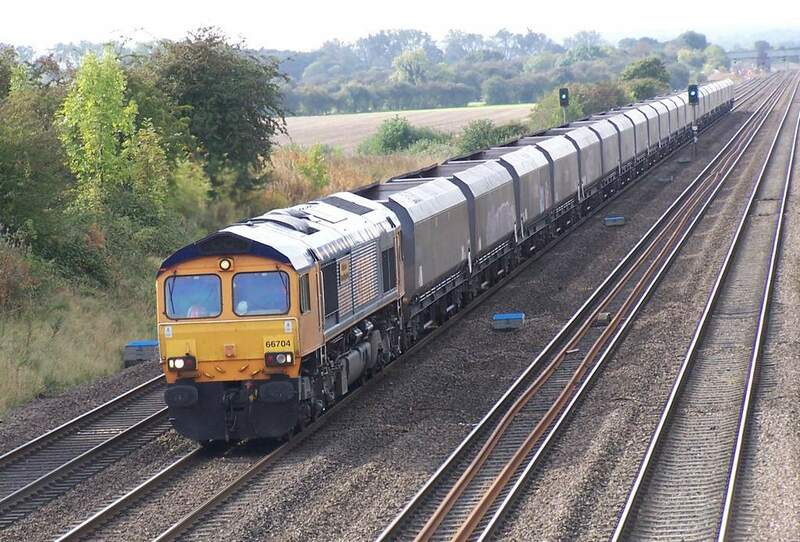 These untis are similar to the EWS Class 59 and 66 series of locomotives. Kodak DC260 digital camera, picture taken by A P Ducker (ecml@yahoo.co.uk) who retians all copyright unless permission given. 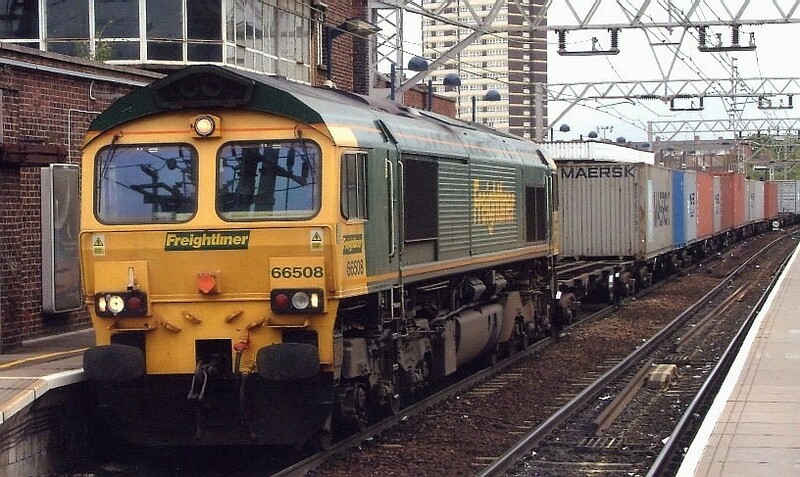 66508 pauses for the all clear at Stratford on May 25th 2005. 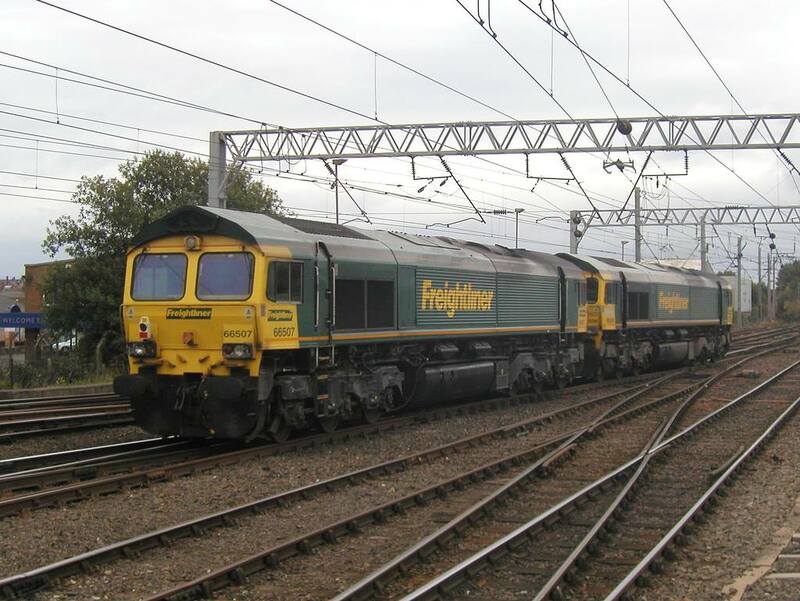 Freightliner's 66503 pauses at Stratford before continuing its journey to Felixstowe on the 17th November 2009. 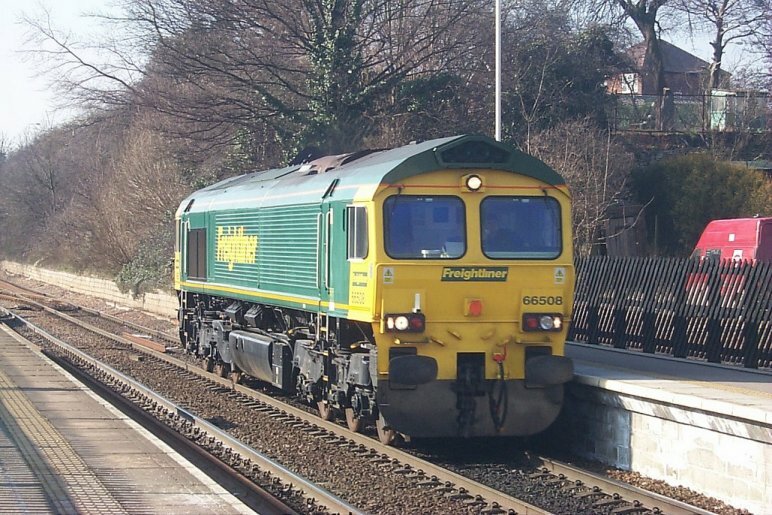 66503 is appropriately named 'The Railway Magazine'. This was first published over 100 years ago and is currently the top selling railway title. 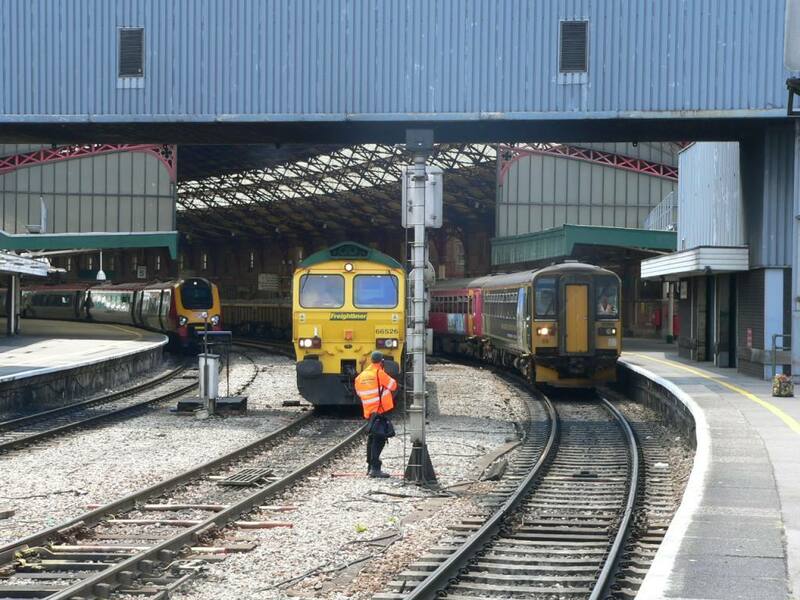 Virgin Voyager Class 220 DEMU 220003, a Freightliner Class 66 diesel locomotice 66526 and a Wessex Trains clas 153 DMU 153308 at Bristol Temple Meads. 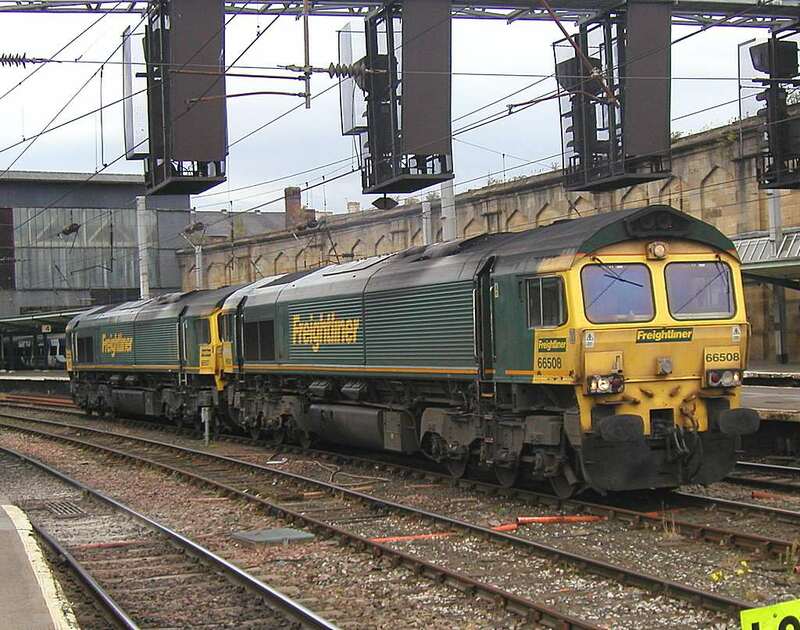 The Virgin train is waiting at platform 5 from where it will shortly being a cross country service to Newcastle as the Freightliner locomotive is waiting with a ballast train on one of the two centre tracks between platforms 3/4 and 5/6. The Wessex Trains DMU has just departed platofrm 3 with a local service. 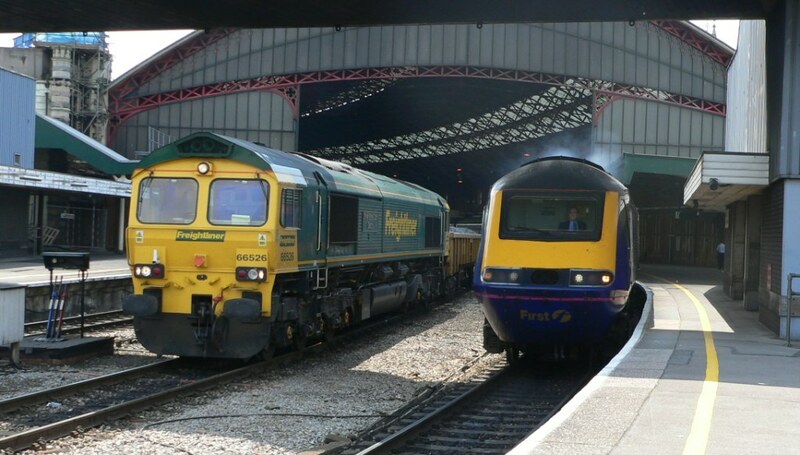 Virgin Voyager Class 220 DEMU 220003 and Freightliner Class 66 diesel locomotice 66526 at Bristol Temple Meads. 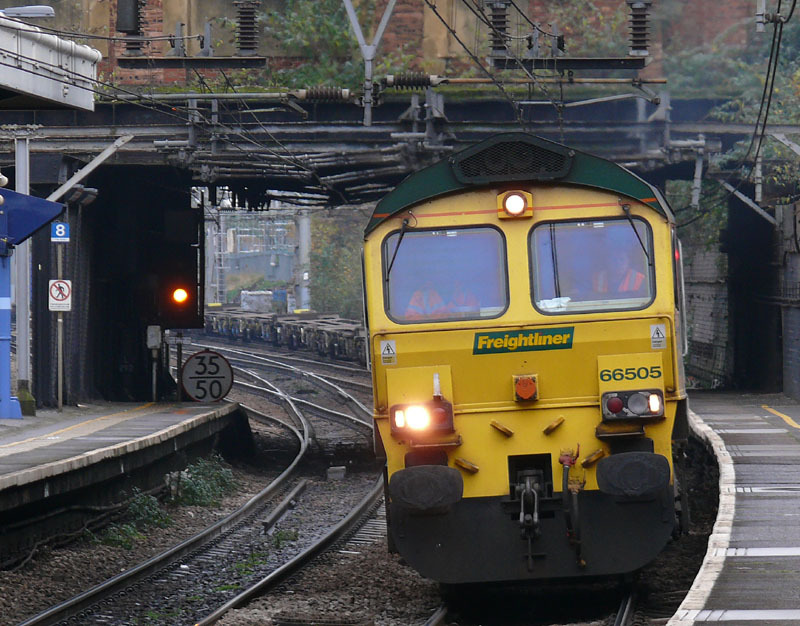 The Virgin train is departing platform 5 with a cross country service to Newcastle, while the Freightliner locomotive is waiting with a ballast train on one of the two centre tracks between platforms 3/4 and 5/6. 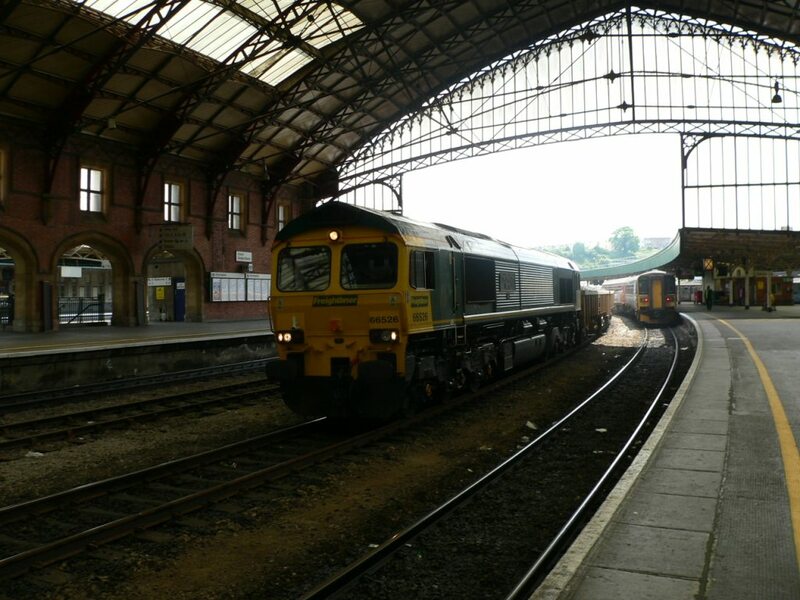 Freightliner Class 66 diesel locomotive 66526 "Driver Steve Dunn (George)" and an unidentified First Great Western class 43 HST at the northern end of Bristol Temple Meads station. 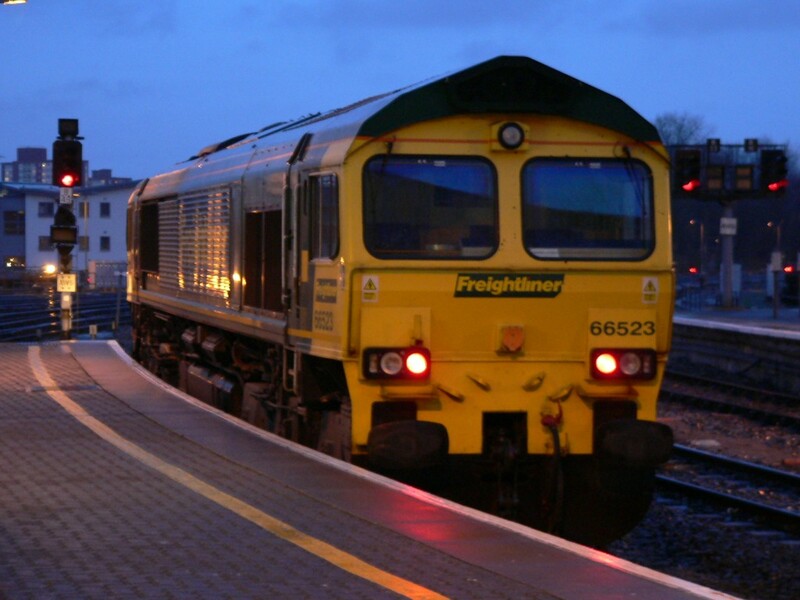 Freightliner Class 66 diesel locomotive 66526 hauls a ballast train through Bristol Temple Meads station. 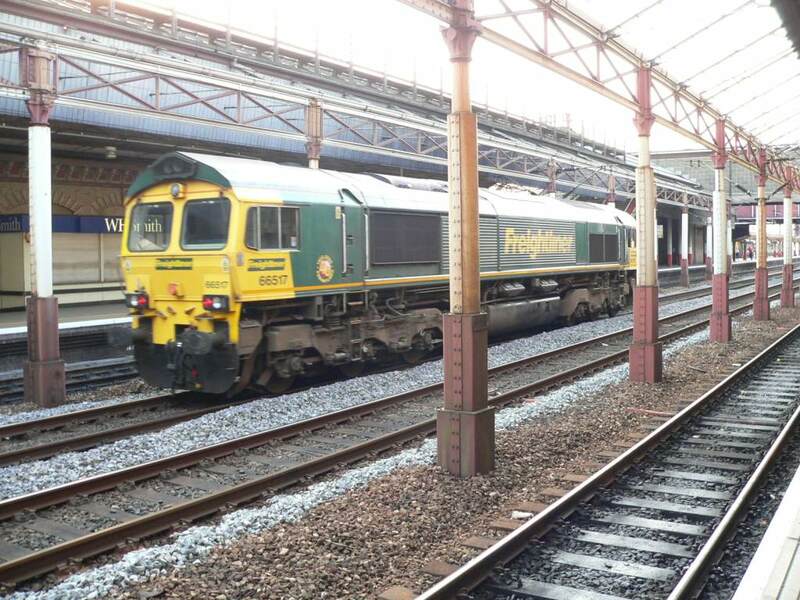 Freightliner Class 66 diesel locomotive 66526 "Driver Steve Dunn (George)" waits at a red singal at the northern end of Bristol Temple Meads station with a ballast train. 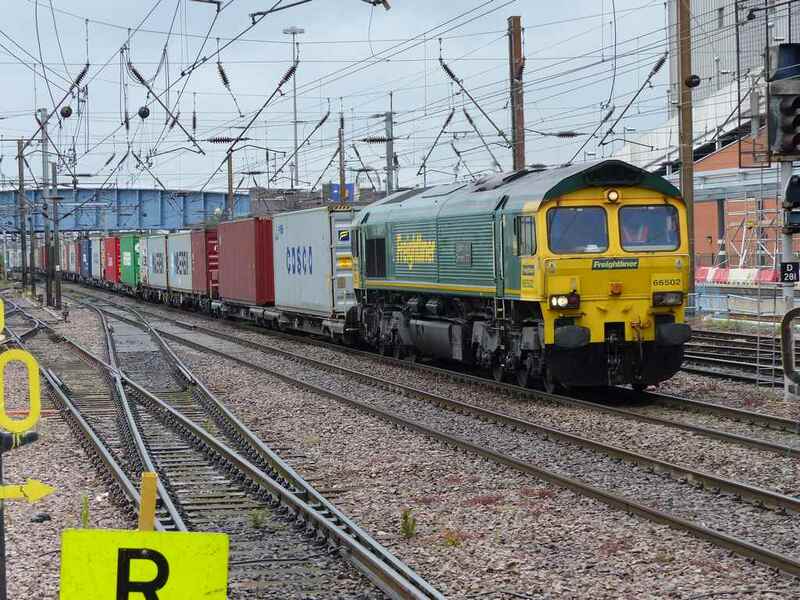 A tall building near to Stratford station casts an unhelpful shaddow during the morning at this time of year, so as a result this was the only picture of a freight in the snow we managed to get during our time there. 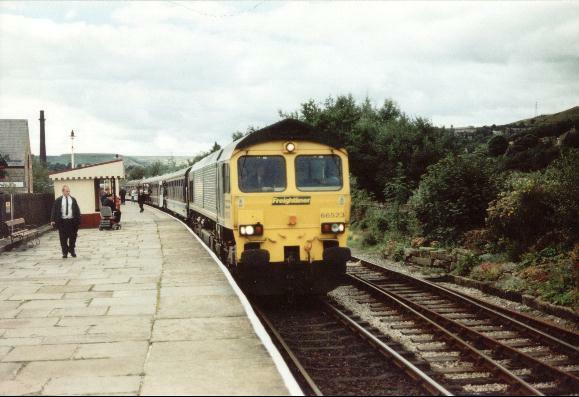 Its 66501 and the date January 29th 2004. 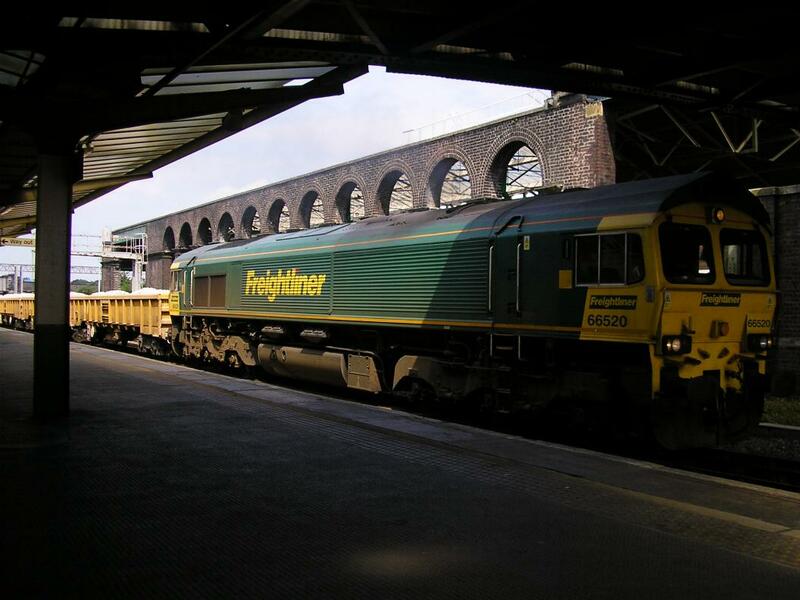 The old face of Freightliner in the form of 47303 alongside the new 66508. 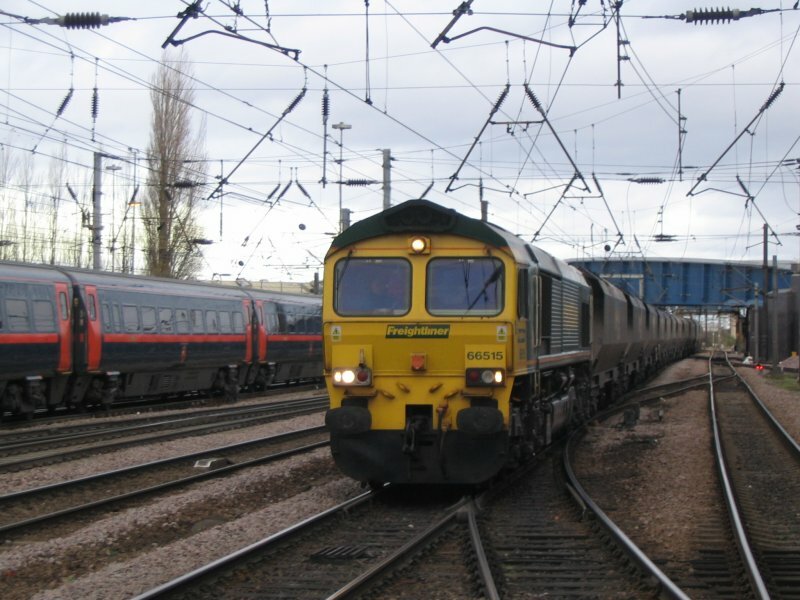 Pictured at Stratford on May 25th 2005.